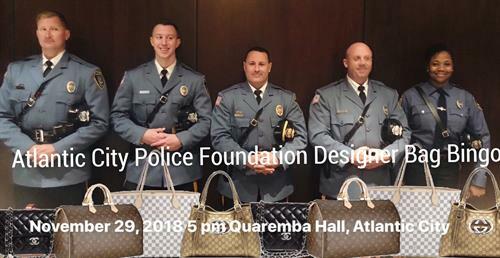 Join the Atlantic City Police Foundation for our Second Annual Designer Bag Bingo at Quaremba Hall at Saint Michael's Church, 10 N. Mississippi Avenue, Atlantic City, NJ 08401 on Thursday, November 29, 2018. Parking at the Church (limited spots), street parking or parking at the Wave parking lot (at the foot of the Atlantic City Expressway - enter on Baltic Avenue). Those that attended last year's sold out event had a wonderful time with great bags, great prizes, great food, and tons of fun. Doors open at 5:00 p.m. with bingo action starting at 6:00 p.m. Your $35 ticket will include a bingo card for 10 rounds. Dabbers ($1 each) and additional bingo cards may be purchased upon arrival. Basket and 50/50 raffle tickets will also be sold on site the evening of the event. We are not equipped to take credit or debit cards at Quaremba Hall. Please bring cash or checks. All participants must be present to win. Complimentary coffee and donuts will be available while they last. Please bring your own snacks and drinks. Don't forget plates, napkins, cups and utensils. A corkscrew is a must! Bring your friends and enjoy this fun-filled night out! Don't miss out on what is sure to be a great time for a great cause. P.S. If you would rather pay by check, please send your check payable to the Atlantic City Police Foundation, P.O. Box 8323, Atlantic City, NJ 08404 noting the names of the attendees and including an email of at least one member of your group must also be included since we will send tickets only by email. Doors open at 5:00 p.m. Bingo action starts at 6:00 p.m.
$35 per attendee. $1 per dabber.